Even when she dressed up as a princess for Halloween, Katie opted for the one from Star Wars. The force is definitely with this 7-year-old. So when the first-grader told her mother she no longer wanted to take her beloved Star Wars water bottle — which incidentally matches her Star Wars backpack — to school, and instead asked to take a pink bottle, Carrie Goldman's mommy radar went off. "It didn't make sense," the Evanston mom said. After some coaxing, Katie told her mom what a few boys had said to her at lunch last week. "They were saying that only boys like Star Wars. Girls don't," Katie said. Then the bright-eyed, chess-playing, ballet-bowing little girl cried. It was enough to make any parent's heart break. 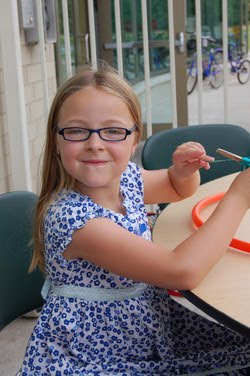 Her mother reminded her it was a OK to be different, to which Katie, who is adopted and the only one in her class who wears glasses, responded, "But it's not OK to be too different." Goldman, an artist who blogs for ChicagoNow, posted the story online this week with the title "Anti-Bullying Starts in First Grade." It went viral. More than 8,000 people commented, Tweeted and Facebooked the story. "It touched an innate goodness in people," said Goldman, 36. "A lot of people are reaching out because they see their kid in Katie." Each night, Katie read a few of the encouraging comments (prescreened by her mother) aloud. "You are awesome and cool for loving Star Wars!" one wrote. "Be true to who you are," said another. And a few shared variations of "I am totally jealous of your water bottle." The PTA president sent out the post on the school's e-mail list, Goldman said, and the father of another first-grader sent his daughter to school clad in a Star Wars shirt. The girls sat together at lunch, and Katie squealed as she shared the news with her parents. It was her dad, Andrew, a high school math teacher, who got her hooked in the first place. The next day, Katie swapped out the pink bottle for her trusted Star Wars one. By Friday she was back to her Katie self, triumphantly declaring, "I'm wearing a Star Wars shirt right now."